9 "Westside Friends of Jackie Goldberg"
Kathleen (Kathie) Sheldon is married to Steve Tarzynski. In the early 1980's Kathie Sheldon was a member of Santa Monica Democratic Socialists of America. In the early 1980's Kathie Sheldon was a leading member of Los Angeles Democratic Socialists of America. In 1981 Kathie Sheldon led a workshop entitled Do You Want to Start a Socialist School? at the 10th Convention of the New American Movement. The convention was held in a union headquarters in Chicago and ran from July 29 - August 2, 1981. 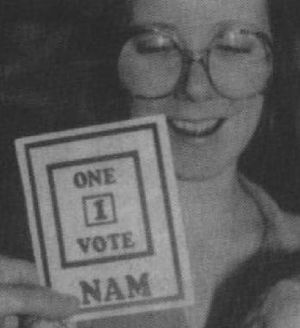 In 1981 Kathie Sheldon was a member of Los Angeles New American Movement. In 1979, Kathie Sheldon was a member of the Socialist Community School Committee. As at Feb. 1, 1980, Kathie Sheldon was a member of the Socialist Community School Committee. In 1982 she was a committee member of the Socialist Community School in Los Angeles. Kathleen Sheldon, a DSA member, lived in Mozambique for two years in the early 1980s and has written on the history of women and work in Mozambique. A meeting of Mozambique Support Network took place Friday, March 11, 1988 and Saturday, March 12,1988 at the Lutheran School of Theology in Chicago, Illinois. Regrets were sent by Mike Johnson (Iowa), Kevin Danaher (California), Bill Minter, Kathy Flewellen (Washington, DC), Ruth Minter (Maryland), Kathy Sheldon and Steve Tarzynski (California), Paula Voelkel (Wisconsin), Coke McCord (New York) and Todd Hawkins (Washington), Treasurer Lisa Brock was unable to attend due to the tragic death of her mother in Ohio. In 1985 and 1986, Kathie Sheldon of California was listed as a member of the Feminist Commission of the Democratic Socialists of America. 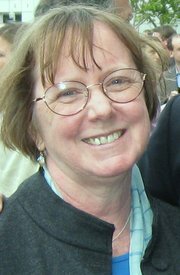 "Westside Friends of Jackie Goldberg"
Kathie Sheldon , a member of Democratic Socialists of America, is the author of Historical Dictionary of Women in Sub-Saharan Africa, second edition (Rowman and Littlefield, 2016). Although aimed at an academic audience, this book is useful to anyone seeking to know more on the topic. This page was last modified on 5 June 2017, at 15:34.